Rug and toughed, autumnal colors, and the right sense of enthusiasm bring back walking to new levels. Mouth-watering hues and playful details add some sass to both fresh and staple silhouettes. Clockwise from top: Fergie ruffled sandal; Chocolat Blu cap-toe ballerina flat; Farylrobin multicolored heel; woven slide by Matiko; BC Shoes flat. 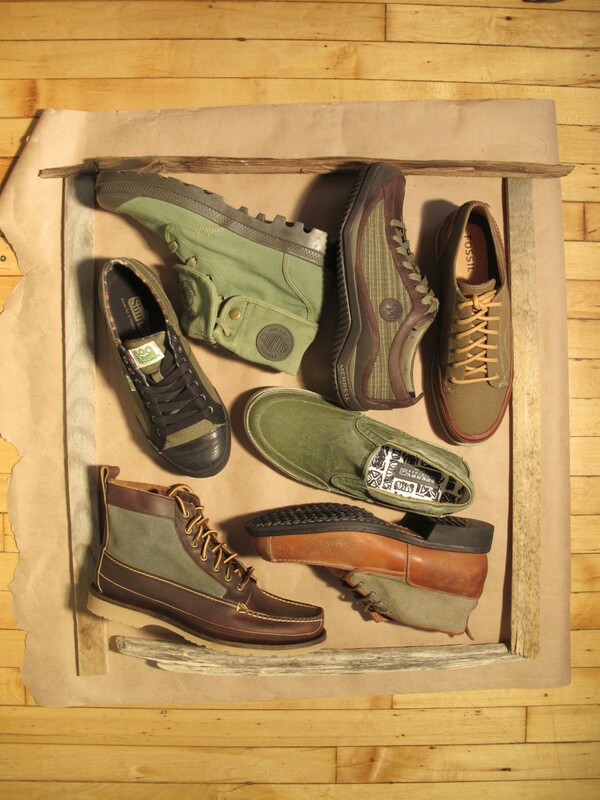 Rugged canvas hits men’s styles in a range of the light green hue. Clockwise from top left: Palladium lug-sole boot; sneaker by Merrell; Fossil lace-up; Sperry Top-Sider slip-on; chukka by Timberland; Red Wing boot; Simple sneaker.